The B.C. 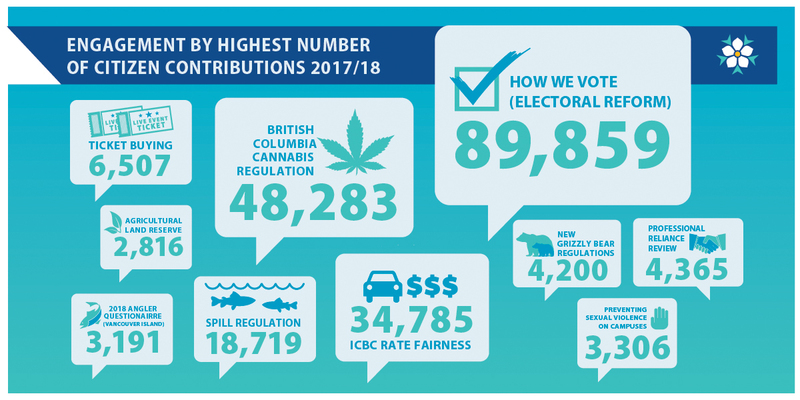 government has put a concerted emphasis on involving British Columbians in the programs, policies and services that directly affect their lives starting in 2012. As a result the Citizen Engagement Team was formalized within Government Communications and Public Engagement to help ministries create engagement opportunities to meet our commitment to transparent, inclusive and responsive governance. There is to guide to help develop engagement projects within the B.C. government. This Citizen Engagement Handbook is publicly available to those interested in planning a citizen engagement initiative. Since 2012, the B.C. government has provided more than 296 opportunities for citizens to give input on a broad spectrum of subjects ranging from environmental protection to health and safety. 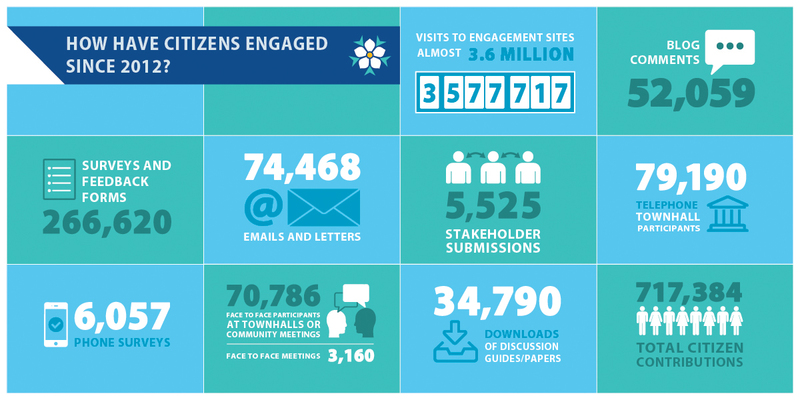 In that time, citizens have contributed their feedback more than 717,384 times and visited our engagement sites almost 3.6 million times. Input has come in a number of different ways including face-to-face events, telephone townhalls, blogs, surveys, question apps and email. How have citizens engaged since 2012? 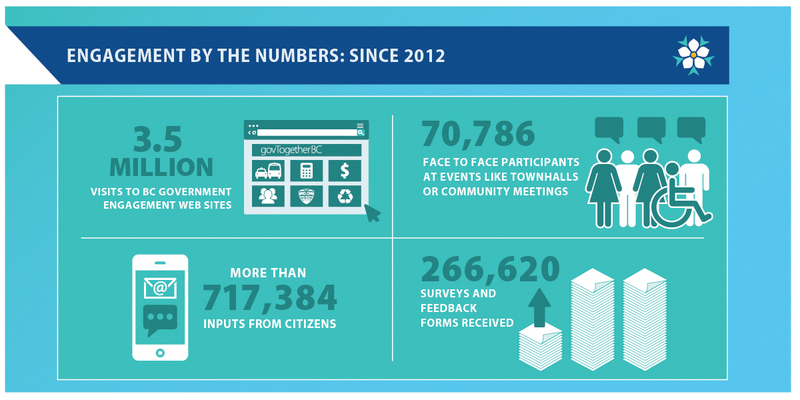 3,577,717 visits to engagement sites, almost 3.6 million; 52,059 blog comments; 266,620 surveys and feedback forms; 74,468 emails and letters; 5,525 stakeholder submissions, 79,190 telephone townhall participants; 6,057 phone surveys; 70,786 face to face participants at townhalls or in community meetings; 3,160 face to face meetings; 34790 downloads of discussion guides/papers; 717,384 total citizen contributions. The B.C. government established legislative framework for the legalization of non-medical cannabis. End of Grizzly Bear Hunting. The Province is amended Wildlife Act regulations to enforce the closure on the grizzly bear hunt. Government modernizes ICBC rate design to make insurance fairer. Stops of interest signs are being installed around the province based on interactive map identifying 75 publicly nominated sites of historical significance to Chinese Canadians and British Columbia. By June 2021, British Columbia’s general minimum wage will rise to at least $15.20 per hour. To lower costs for families, we reduced MSP fees by 50% this year and will eliminate them completely by 2020. British Columbia will re-establish the B.C. Human Rights Commission to address inequality and discrimination. This site offers a platform where you can read about the results of our public engagements, find out what sort of changes are coming soon, or browse through open projects and explore opportunities to contribute your feedback to the issues that matter most to you. Engagement is crucial to government’s decision-making process, you can visit the site regularly, and follow @govTogetherBC on Twitter for updates on engagements, results and ways to engage with your community.